Had no clue that days have passed before I posted in my blog. Flu is a mean thing that takes away all the thrill from the holidays. Well, I am recovering and I wanted to post the spicy mooli paratha that I made for dinner. 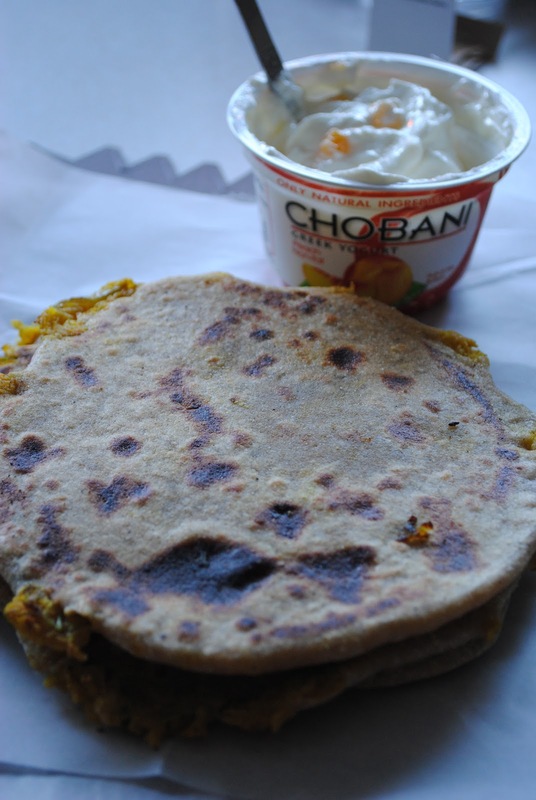 There are many ways to making this paratha. The cooked version, and the uncooked version. I prefer to make the cooked version. I like it because, it saves me from having a mess when it comes to assembling the paratha. The mooli or radish tends to secrete a lot of water and the addition of salt does not help it either. A very effective way to handle this problem is to cook the moli and allow all the water to disappear and have a dry filling. I love the taste of this paratha and love to share it here. 1. Peel the skin off the the radish and grate it in a box grater. (Note: I prefer this over the food processor grater, because it keeps the radish crisp). 2. Heat the pan with some oil. Add the raddish and start to cook it. The quantity will shrink. At that time, add the spices, salt, lemon juice mix well and cook until all water disappears. ( Note: I like to make the filling a little spicy). 3. Add cilantro as garnish and allow for it to cool. 4. Take the dough, roll and flatten it to 5 inch circle. Place the cooled filling inside, wrap the dough around the filling. 5. Roll it out into an 8 or 9 inch paratha. Heat the iron griddle to medium high. 6. Cook the paratha on both sides, add oil on both size and serve it hot with raita or fresh yogurt. delicious yum yum mooli paratha. I love making naan bread, but have been meaning to challenge myself to make a stuffed flat bread as well. This looks delicious. Srimathi, Hope you are feeling better. This mooli paratha is so yumm that I love to have it now. Parathas look awesome, get well soon.. The parathas look great. I have never made a curry for the stuffing before. This looks tastier than what I make! Thank god you are feeling better now, prefectly stuffed parathas, simply love it. This is very testy and healthy paratha.